The Jeep Compass Plug-in Hybrid can do 0-100kmph in around 7 seconds! Has an all-electric range of 50km and a top speed of 130kmph in EV mode. Gets an e-AWD system instead of a conventional AWD system. Electric and hybrid cars have been the talk of the town since the last few years and this year’s Geneva Motor Show was no different. 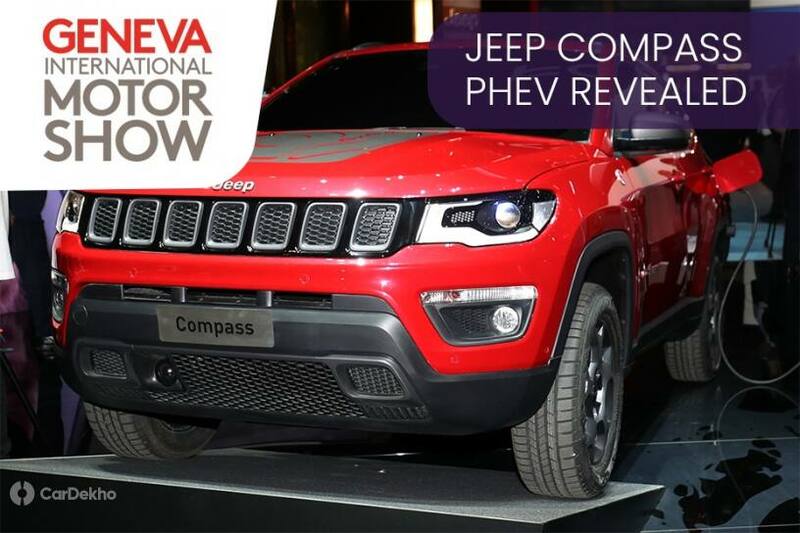 A majority of carmakers, including Jeep, have showcased at least one electrified vehicle at their pavilion The American carmaker showcased the PHEV (Plug-in Hybrid) variant of its most popular SUV in India, the Compass. The Compass PHEV is powered by a new 1.3-litre turbocharged petrol engine, which along with an electric motor, makes a total of 240PS. This 1.3-litre turbocharged petrol engine that produces 180PS of power and 270Nm of torque was first introduced in the refreshed version of the Renegade and is expected to make its way to the India-spec Compass too. It may replace the less powerful 1.4-litre MultiAir II (163PS and 250Nm) motor in the near future. Jeep claims that the Compass PHEV can go from 0-100kmph in around 7 seconds. It has an all-electric range of up to 50km and can hit a top speed of up to 130kmph in pure electric mode. With the introduction of an electric motor, Jeep has also replaced its conventical AWD system with an e-AWD. Here, the rear wheels are powered by an electric motor instead of a conventional propeller shaft setup. In June 2018, when FCA announced its five-year business plan, the conglomerate had confirmed that the Jeep Compass will soon feature a plug-in hybrid (PHEV) model and an all-electric version by 2022. Even though Jeep has showcased the PHEV version at the Swiss auto show, it is yet to reveal when it will hit the production line. That said, expect the model to be introduced globally next year. Since Jeep manufactures the right-hand-drive Compass in India and Europe, there’s a possibility that the PHEV and EV versions of the compact SUV will also be assembled here at FCA’s facility in Ranjangaon. If that happens, FCA might as well introduce it in the domestic market since by 2022, stricter emission norms in the form of CAFE (corporate average fuel efficiency) are expected to be implemented in India. The implementation of new norms will require automakers to take strict measures to improve the fuel efficiency of its entire fleet and curb CO2 emissions. In such a scenario, we expect carmakers to have multiple mild- and fully hybrid products in their portfolio soon.